Scotland’s Huw Jones hopes the element of surprise can help him shock Wales at Murrayfield on Saturday. The Edinburgh-born centre, who plays his club rugby for South African Super Rugby franchise the Stormers, is relishing his first Six Nations campaign. While the majority of his Scotland team-mates will be familiar with Rob Howley’s squad from their Guinness Pro12 clashes, Jones is stepping into the unknown this weekend, but the 23-year-old hopes it will be the Welsh who will be left scratching their heads at full-time. “I see the fact I haven’t played against most of these guys as an advantage as well as a disadvantage,” he said. “I might not know what to expect from them, but they don’t know what to expect from me too. “I get a lot of my knowledge from my team-mates by asking them what they would do. “Once you’re out on the field it’s not so much the analysis that goes through your head anyway but more the actual situation there and then. Interim Wales boss Howley will no doubt have studied Jones’ five previous Test appearances in the hope of finding out how he will approach Saturday’s game, and will have noted the budding midfield relationship with Glasgow’s Alex Dunbar, pictured right. 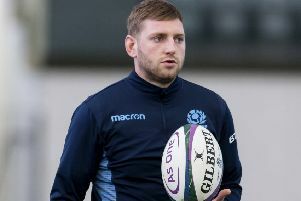 “It’s a fairly new partnership but I think we are improving game by game,” Jones said of the link-up, which will be rekindled next season when he completes a switch to Scotstoun. “Defensively we have got a little bit better. We’ve been working hard at making sure we talk to each other the whole time. “In the attacking side we also complement each other too and it’s gone quite well. “We get on pretty well both on and off the pitch, so that helps form that bond. “We’re training with each other every day right now, so you end up being able to read how each other plays and then react to it. Scotland head coach Vern Cotter will have to hope the well-oiled Warriors back line built by Gregor Townsend can help mask the loss of skipper Greig Laidlaw, ruled out of the rest of the championship by injury. His replacement will be either Ali Price or Henry Pyrgos – both team-mates at Glasgow – and Jones reckons that should limit the disruption felt by the national team. He said: “That is the silver lining for us. It is a big loss with Greig being out but the fact we have two other scrum-halves who are experienced is great. “Henry and Ali both play regularly with [stand-off] Finn Russell at Glasgow so it could be a great thing that they have that partnership going already. It’s not like we have someone totally new coming in. “They are both quality players, so I don’t think it will be a problem for us. Jones expects Wales to target the Scottish scrum, which has creaked during both their opening-day win over Ireland and the loss to France in Paris.